5 Hacks for Getting Kids to Stay at the Dinner Table – Kids are up and down, running around during dinner time, and sometimes all you want to do is strap them down so they will stay put. What if there was a way to get them to WANT to stay without any struggle? I’m so excited to be back here to talk to you about two of my favorite subjects ever. Kids & Food. Sometimes it can be a total struggle to make those two things work together in a healthy manner, but that’s why Super Healthy Kids rocks. Before I talk to you about my tips for keeping kids at the dinner table, I wanted to make sure you got a look at my Resource Guide for over 65 Game-Changing Tools for Getting Healthy. I’ve put together all the essential ingredients for stocking your kitchen, gadgets for cooking, and even some workout necessities. You don’t want to miss this one – especially cause it’s free! You’ve done all the meal-planning, you’ve carved time in your busy schedule to actually make dinner, you actually get it all on the table while it’s still hot, but you run into one little problem. 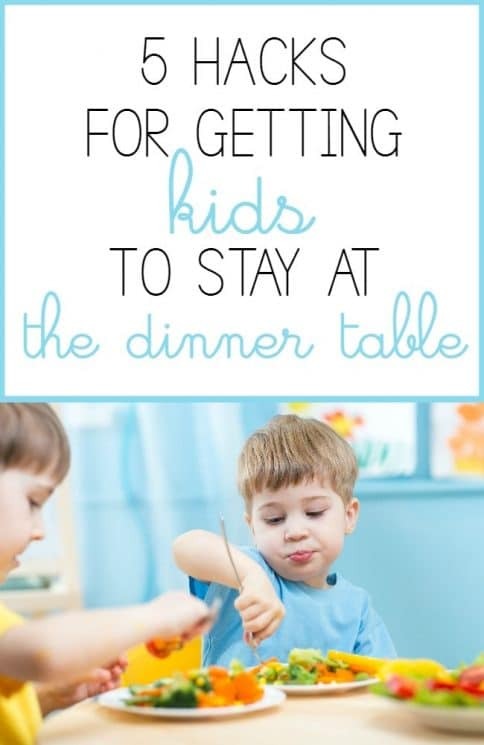 Getting those kids to stay at the table for more than 5 minutes! I’ll be 100% honest. I have the best kid in the world. Ok, so maybe I’m a little biased. In all reality, he is a very good kid. He’s always stayed at the dinner table until he has permission to be excused. He always eats until he’s full. And he’s not very picky at all. People have actually come up to me in restaurants asking how I get him to eat a whole salad and stay put during the entire meal without causing a huge scene. Often we look around at restaurants and wonder why there are kids running around like crazy little minions. I wasn’t going to say this because, well, I’m not one to place blame on anyone. But I do feel very strongly that it all has to do with the way the parents set the tone for dinner time. I know that some kids are just naturally “spirited,” and others are more mellow like my guy. But I also do believe that there are things we can do as parents to encourage a calm dinner time where everyone stays at the table the entire time until they have permission to get up. The tips I’m going to share with you will work whether you’re home, at a guest’s house, or are eating at a restaurant. I highly suggest that you put them into practice as early as you can in your kids’ lives so dinner manners will become habit when they’re older. Of course, if you have a older kid who just isn’t staying at the table, start with these tips as soon as possible and get to work. With a little time, patience, and perseverance, you’ll be eating together as a happy family and dinner won’t be a stressful fight. Have your kids help with dinner. This is perfect for kids who are having trouble staying at the trouble AND who tend to be overly picky about what they eat. Get them involved in dinner time. 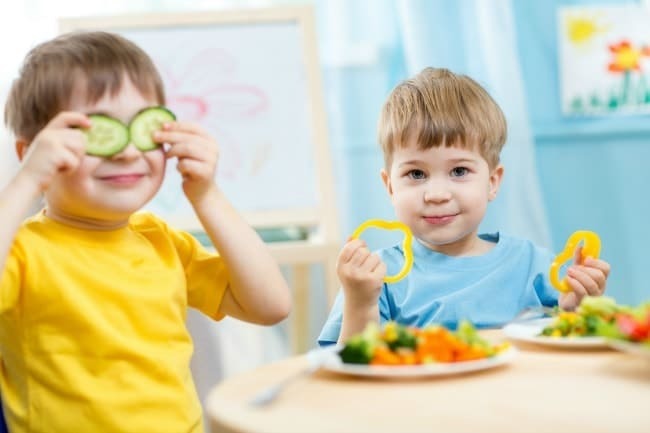 Whether they’re old enough to start chopping the veggies for the salad or they’re just helping you pour ingredients into different bowls, there is something for everyone at any age to do in the kitchen. Kids have a huge sense of pride when they create something. Whether it’s a drawing, a sand castle, or a mess. They want to show you right? You can’t tell me you’ve never heard that one before. Having a hand in creating part of dinner will give them a sense of accomplishment, and they will feel extremely proud of themselves. Not only will they want you to try their masterpiece, but they’ll want to get in on their creations as well. I know, as a busy mom, it can be really hard to let your kids help in the kitchen because often you can do it much faster. But I promise you that it will be worth the time to slow down and help them help you. Come up with conversation starters. There are actual products out there for this very reason. This is one I think is great. The idea is that it will engage your kids in conversation, and what kid doesn’t like to talk and talk and talk, am I right? They’ll think of it as a game, and that is usually enough to keep them engaged and at the table. Of course, games can be distracting, so you can add rules. Like the next person at the table to eat 3 more bites gets to ask the next question. Or if you get down from the table at all over the course of dinner time, you’re not allowed to answer any questions. They won’t think of these are family rules that are made to be broken. They’ll truly just see these as rules of the game. I know. This can totally be a rough one. As parents, we can be quick to go straight to the punishment when our kids aren’t behaving the way we think they should be. Instead, let’s try and switch things around by creating some positive reinforcements that will get your kids excited to stay at the table. So instead of threatening to send your kid straight to bed if they don’t stay at the table to finish dinner, you could create a reward system. A sticker chart. A marble jar. A clothespin chart. Something along those lines. For example, if your kiddo stays at the table 5 times (tracked by the stickers, marbles, clothespins, etc) they will be entitled to pick a fun activity on the weekend. Before the week starts, you could choose the activity together so you can talk about it all week long, getting them all amped up and excited about how much fun it’s going to be when they get to actually do it. Serve food in fun ways. Keep things interesting for kids. How boring is a regular hamburger? Pretty dang boring. But what about mini hamburgers on skewers? Serve food in fun shapes, in fun containers, with fun dipping sauces. Obviously, you don’t have to be fun and creative all the time, but switching it up every so often will keep things interesting. What if you made dinner restaurant-style where you gave everyone a menu, took their order, and served them their meal? Way fun! Ask your child to decorate the table before dinner. This goes back to the first idea of getting your kids involved in the process. Have all the dishes, silverware, and placemats ready for them to put on the table, and then have them “make it pretty.” That could mean making place tags for each person and choosing where they sit. It could mean finding a flower or two in the yard (your own of course) to put in a mason jar. A random Frozen or princess centerpiece. A super hero for each place at the table. Or maybe they could design each individual placemat. Whatever “pretty” means to your kid. The chances of them sticking around to admire their beautiful work is much better than if they didn’t have a hand in it. Of course, you’re doing all you can to keep your kids healthy from the time they wake up in the morning until they’re peacefully asleep at night. Just make sure you’re also taking care of yourself! Make sure you grab access to my super handy Resource Library for all your health needs. Seriously, this isn’t just a one-off guide. This is an entire library where I house my free e-books, printables, guides, etc. It’s all in one place, and I’m updating it constantly. So you’ll want to check it out.